You are a cop. You and your fellow officers have gathered to discuss the growing corruption within the district. 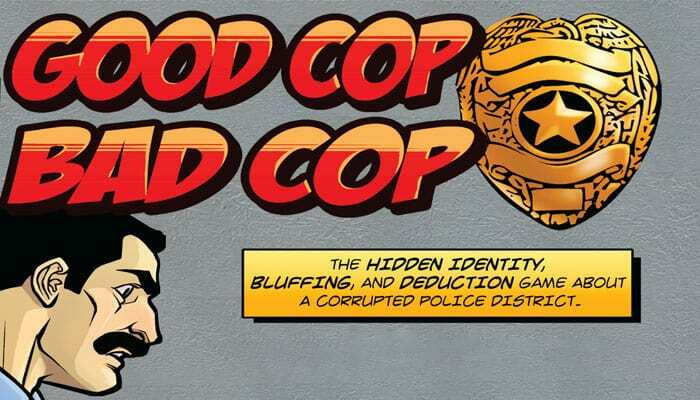 One of you is secretly leading the crooked cops as the Kingpin, while someone else is secretly leading the honest cops as an Agent. Work to discover the opposing leader and take them out before the other team eliminates your leader. 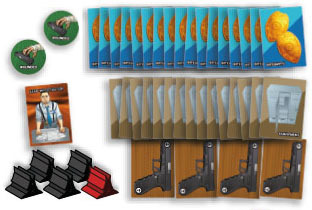 Each Gun, Integrity card, and Equipment card has a number in the corner to indicate whether it will be used during this game. Before playing, remove any Guns and cards that show a number in the top right corner that is greater than the number of players in the game. Remove the Agent and Kingpin cards from the Integrity deck and place them in a separate face-down pile. Shuffle the Integrity deck and add enough cards to the pile to deal one card to each player. Do not view these cards. Shuffle that pile and deal one of the cards to each player, then deal each player two more Integrity cards from the Integrity deck. If there is an Integrity card left over, remove it from the game without viewing it. Place the Lead Investigator and Guns in the stands. Deal one random Equipment card to each player and place the Guns in the middle of the table. The player who has most recently been shot (in a game or real life) goes first. Give that player the Lead Investigator. Players will be divided into two teams: Crooked and Honest. Each team will attempt to locate and eliminate the leader of the opposing team. After viewing their Integrity cards, each player places them face-down on the table. Players may place them in any order they choose, but this order cannot be changed once the cards have been placed on the table. Players may discuss their Integrity cards and provide truthful or false information about which cards they have, but no player may show any face-down Integrity card to any other player. If the majority of your Integrity cards are "Honest" and you do not have the Kingpin card. Your turn consists of three phases. Choose to take one of the following actions. Take one face-down Integrity card from any player, view that card, and then place it back in its original location. You may not show the card to any other player. Draw one Equipment card. If you have any face-down Integrity cards, choose one and turn it face-up. Take a gun from the middle of the table and place it in front of you. If you have any face-down Integrity cards, choose one and turn it face-up. Shoot your gun at the player at whom you are aiming. Drop your gun by placing it back in the center of the table. If you are holding a gun after your action is resolved, you must aim the gun at any player other than yourself. Play proceeds clockwise. Pass the Lead Investigator to the player to your left. If you are shot, you must turn all of your Integrity cards face-up on the table. If you are not the Agent or Kingpin, you are eliminated from the game. Turn your Integrity cards sideways to indicate that you have been eliminated, return your Equipment card to the bottom of the deck, and return your Gun to the center of the table. If you are the Agent or Kingpin, you are not eliminated the first time you are shot. Instead, you must take a Wounded token and draw one Equipment card. Once you have a Wounded token, you are eliminated if you are shot a second time or if you no longer hold the Agent or Kingpin card. You may only hold one Gun at a time. Any time you get a Gun, immediately aim it. You may only change where you are aiming at the end of your turn during the Take Aim phase. You may never aim a Gun at yourself. When you aim a Gun, you must announce the name of the player at whom you are aiming. You must also place the Gun in front of you on the table with the barrel pointing toward that player. Equipment cards may be used at any time unless otherwise specified on the card. When you use an Equipment card, place it on the bottom of the deck. When you use an Equipment card, no other Equipment cards may be played until yours is resolved. The hand limit for Equipment is 1. If you have more than one card, you must choose all but one and place them on the bottom of the deck. You may not use any Equipment cards until you have reduced your hand size to 1. You may choose to use an Equipment card after a player has announced their action for the turn, but before the action is resolved. If you do, the player may choose to (or may have to) change which action they will take after the Equipment card is resolved. Multiple Equipment cards may be played before an action is resolved. The Honest team wins if the Kingpin is eliminated. The crooked team wins if the Agent is eliminated. If, at any time, a player has both the Agent and the Kingpin cards, that player alone wins.